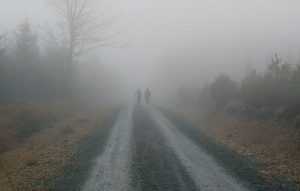 Carrick: Too misty to even see any gorillas! Epic courses and epic weather in Carrick last Sunday for the 5th Leinster League event, where the weather, Carrick Mountain and Valdas’s courses combined to present a real challenge! Putting out the controls on Saturday in low visibility was interesting, but then came the wind and rain for Sunday so the runners got the full benefit. On top of all that, Valdas injured his ankle on Saturday so that putting the controls out became more of a task than expected. We used the west side of the forest, which is normally only visited by the longer courses, but luckily this was the side which was the most sheltered from the south-east winds and rain on the day. The star of the show was Úna and Kevin’s camper van which made the administration of the event so much easier. Some reminders to orienteers, though: (1) don’t just turn up at the start assuming that a family member has registered you for the event and (2) take note of the course closing time and come back by then. An orienteering event is not a licence to stay out in the forest all day! If you go out in the forest without the organisers knowing you are there, it has safety implications: we believe everyone to be back safely but you could still be out there. 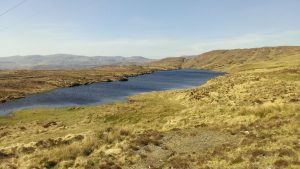 In the second case, we had Mountain Rescue on standby to start a search for a missing competitor who didn’t return by the close of the course. Luckily it all ended well. Shane Lynch (CorkO) was 8 minutes clear of Kevin O’Boyle (CNOC) on the Brown course and Aoife McCavana (UCDO) was fastest on the Blue. The results are on the IOA site here. Best 3ROC results were Karen Convery (3rd Light Green), Scott Dunne (3rd Red) Cuan and John Riordan (3rd and 4th Green), Mary O’Connell (6th Green) and John McGrath (7th Brown). Thanks to Valdas, Úna, Kevin and Colm for putting the event on. This weekend we have an urban event in Dungarvan, Co. Waterford on Saturday afternoon, and a Munster League event at Mahon Falls in the Comeraghs on Sunday, both run by WatO. Further afield there are events at the weekend in Galway, Cork, Roscommon and Fermanagh – details on the IOA fixtures page here. On Wednesday the Irish Schools’ Championships are on at Emo Court, Co. Lois, where our Cuan Riordan and Aidan McCullough are hoping to capitalise on their wins in the 2nd/3rd Year and Transition Year classes in the recent Leinster Schools’ Champs. Aidan followed in his brother, Eoin’s, footsteps at Santry this week and took 3rd in the Senior Boys’ Steeplechase event in the West Leinster Track & Field Champs: a useful skill for leaping over obstacles in the forest! The 3ROC AGM is on Monday 23rd April at the Dropping Well in Milltown. 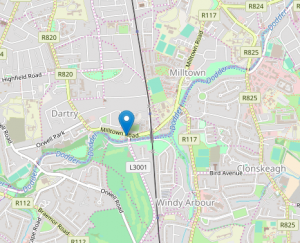 The evening will start at 8 pm with a fascinating illustrated talk on Open Streetmap by Brian Hollinshead, followed by a brief AGM, the presentation of cheques to our 2017 Internationals and light refreshments, so please come along on the night and support your club. The next Leinster League event is on Sunday 29th April at Glendasan, near the Wicklow Gap, run by Setanta. More details next week. We’re all set for the Irish Championships in Donegal in two weeks time: entries have closed with a very good entry: 276 running in the Sprint in Sligo on Friday, 328 in the Middle Distance at Lough Eske on Saturday and 322 in the Long on Sunday. There are 68 teams entered in there Relay on Monday including two 3ROC teams. 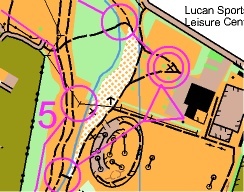 A sprint at Sligo Institute of Technology, two challenging open mountain areas and a relay on the sand dunes at Finner camp should make for a varied and challenging weekend’s orienteering. Throw in the IOA AGM and a Quiz and you’re away! Remember to enter the 20th Shamrock O-Ringen, the three-day in Cork and Kerry at the beginning of June. Entries close on May 11th. See Shamrock O-Ringen. Invitation – you can join us or renew your 3ROC membership at Fabian 4 online here. Remember to like our Facebook page here.